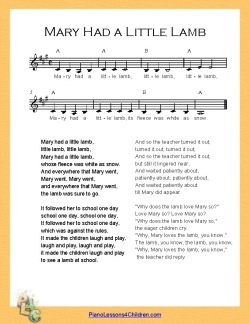 Learn to play children's song Mary Had A Little Lamb in the keys of G, D, and A Major in this beginner piano lesson. I assume you already know how to play this song in the key of C major. You can download sheet music for the lesson below. 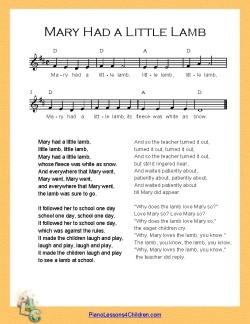 Below you can download printable sheet music (PDF files) for the song "Mary Had a Little Lamb" in the keys of D and A major. Each one has the melody for the right hand, chord symbols for the left hand, and the lyrics. Use them while studying these lessons. I also have sheet music for more complex versions of Mary song (with more chords, with piano accompaniment, etc.). If you need to learn this song in the easiest key, the key of C major, you can find that lesson here.